Bart a Pug, surrendered by the owner yesterday, delivered by a friend. He limped up the hill and had to be carried the majority of the way. We were all sad to see this but as his story was told things fell into place. He's 12, and has NEVER left the house in that time. He was vaccinated once when he was around 3 months old and that's it for his medical! What I saw was a sad, loving little soul who was intrigued, fascinated and excited by a world he'd never really been a part of. Walking the 25 yards to us hurt his feet too much, as he's never walked on cement, his pads as soft as a puppy's but he kept going and continued to walk around looking through cloudy eyes, sniffing the air and all in his path. He melted and broke every heart and he didn't have to try. He went to the vet today and the results after desex, vaccination, pro-heart vaccine, and 9 teeth removed not that he had many to begin with, now he has a total of 8! Ear infection, eyes - keriteratitis, degenerative joint disease in his foreleg which is causing him to limp. I have to say I expected far worse, though this was bad enough! The eyes will be fine with regular eye drops, the ears also with daily cleaning for a week or two, he'll have a weekly injection, then monthly for his leg. We'll give him supplements too and possibly acupuncture of which I'm a firm believer. Then we monitor him and give him the best of everything as he deserves and give him back the life he has lost. His foster dad will carry him when needed and as he works from home he can take him out for roof visits and to grass areas until his feet harden and then who knows he may get to go for real walks however short. 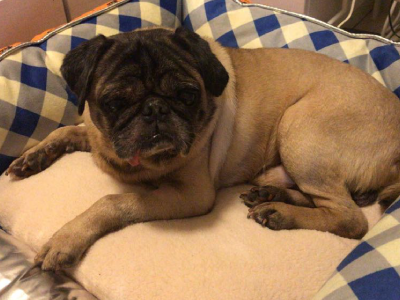 His foster mum loves Pugs, they've been part of her family forever and together will give him all the love he's been denied until a home is found! Go Bart! He’s 12 years old, and is living in a small area, as you can see between the kitchen and living room - not allowed in! After 12 years of loyalty that’s his prize, to be totally ignored why? They have grandchildren in the home and well who ever heard of having a dog with children? Well we’re calling him Bart and we’re going to need a foster ASAP if you can help? He’ll go to the vet for a check up and update in the next two days - please contact us if you can help.